Somali Cats - The Somali is a long-haired Abyssinian cat. 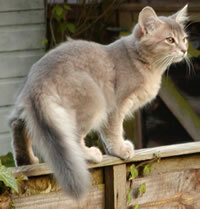 The breed appeared spontaneously in the 1950s from Abyssinian breeding programs when a number of Abyssinian kittens were born with bottle-brush tails and long fluffy coats. Abyssinians and Somalis share the same personality (active, intelligent, playful, curious) and appearance. The only difference between them is the fur length and therefore the amount of grooming required. Unlike most long-haired cats, Somalis shed very little excess hair. Their coat is generally shed en masse, or "blown", once or twice a year, rather than constantly shedding like a Persian or other long-haired cat. Somalis have a striking, bushy tail, which, combined with their ruddy coat, has earned them the nickname of "fox cats" in some circles. In addition to the fluffy tail, the Somali breed features a black stripe down its back, large ears, a full ruff and breeches, contributing further to the overall "foxy" look. This information is licensed under the GNU Free Documentation License. It uses material from the Somali Cat article on Wikipedia.org. 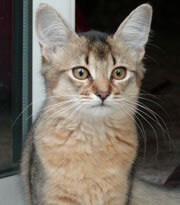 Somali Cat Breeders - Advertise your cattery kittens and cats here. Hillstblues Abyssinians & Somalis - California - Imported Lines 4 colors, Loveable Flying Squirrels, health guaranteed, shipping to nearest airport.